Name this folder AVP_DVD. This will be the name (Label) of our DVD. 3) Copy the contents of the AvP1 Gold CD1 to the root of the AVP_DVD folder. 4) From CD2 copy the .cda files to the root of the AVP_DVD folder. Note: These are not really the audio tracks. You should have 15 files, Track01.cda – Track15.cda. These are necessary for the CD Check during the install. 5) Now use the Windows Media Player to rip the audio off the second CD. It is basically the Aliens Movie soundtrack and it adds ALOT to the atmosphere of the game. You will need to write it back to a CD for use in the game or I just play with Media player while I am playing the game. 6) You can copy the NoCD crack to the AVP_DVD folder, overwriting the original exe. 7) Copy the contents of the AvP2 CD to the AVP2 folder. 8) Copy the contents of the Primal Hunt CD to the AVP2_PH folder. avp2_en_mp1.exe (The Multiplayer Map Pack). 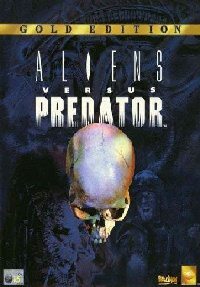 avp2_en_sp1.exe (The Single Player Map Pack). 10) In the Cracks folder create two more folders and name them AVP2_NoCD and AVP_PH_NoCD. Put the NoCD Crack for each game in their respective folder. 11) Download the AVP Gold Custom Install Menu from here and extract the contents of the rar file to the AVP_DVD, overwrite any files when prompted..
(Custom Install Menu created by Grumpy). View the Custom Install Menu here. NOTE: During the install of AVP1 it will stop and prompt you to insert CD2, click OK, you will be informed it passed the verification and will be prompted again to insert CD1, again click OK and the installation will continue. P.S: I would like to thank PSIONIC for the background image. Conversion created with the help of Grumpyâ€˜s original Alien Vs Predator conversion guide.